Everybody knows booze is the perfect present. Nothing makes holiday conversations more bearable or washes down Aunt Fran's rock-hard fruitcake better than a stiff double IPA -- and you can quote us on that (sorry Fran…). So what's better than a bottle with a bow on it? The means to keep your loved one knee-deep in beautiful, beautiful beer all year long. 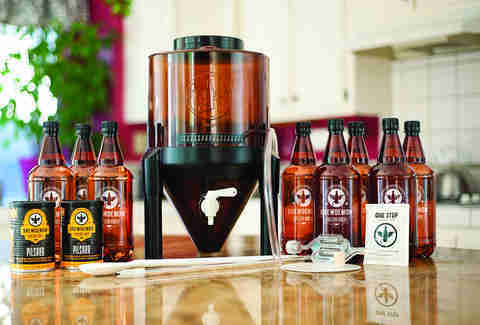 Give the gift that keeps on giving (and giving, and giving) by tossing aside the ready-made sixer and springing instead for one of these nine badass homebrewing kits. Who in their right mind doesn't love them some Rogue? And with these homebrew kits, now your favorite craft beer nut can live out his dream without investing $500,000+ big ones in a Rogue-sized brewery. There are four different flavors to choose from -- Hazelnut Brown Nectar, Dead Guy Ale, Shakespeare Stout, and Brutal IPA -- and, done right, they're preeeetty close to what you'd get in a sixer. The kits are packed with all the basics for a five-gallon, all-grain batch, including dry malt and wheat extract, grains, hops, priming sugar, and hops and grain bags. And while some annoying shipping constraints puts a hold on sending yeast through the mail, a trip to your local homebrew shop should resolve that issue pretty quickly. If you're in the market for something small but totally complete, this one-gallon package is a nice fit. It's an all-grain recipe (i.e., no cutting corners with sugar syrup) and even comes with a sturdy glass jug -- called a "carboy" in the biz -- to make things cleaner and easier. 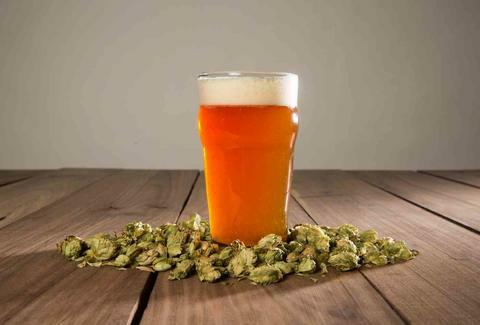 The instructions are crystal clear and tailored to train up a novice in no time, and the vacuum-sealed fresh hops take your brew above and beyond the regular pellet-spiked stuff. A packet of premium brewers yeast is also included. 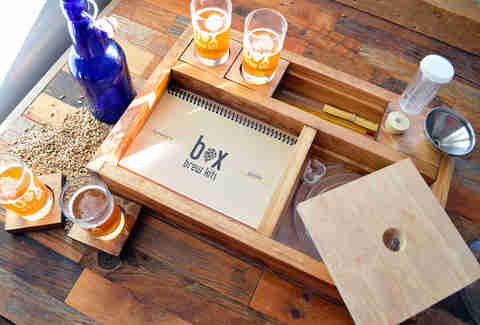 Housed in a streamlined, compartmentalized rustic pine box, Box Brew's "Taster" is by far the prettiest kit on this list. Inside you'll find enough top-of-the-line supplies to aid you in your quest to cook up 10 fine bottles of brew (about one gallon), plus step-by-step instructions and a recipe book stacked with 25 different homebrew ideas. The best part? You're also getting a brand-new brewer's log for all your important notes AND a set of adorable 4.5oz sampler glasses with their own little coasters (you can even get them monogrammed!). The actual ingredients are sold as an add-on ($20 for your pick of a few different ales), but all this beautiful brewing swag makes the extra cash well worth it. Ah, Mr. Beer -- every ambitious dad's favorite brown plastic barrel-turned-toolshed paperweight. But despite its humble reputation, Mr. Beer's actually been adding a whole slew of new, modernized kits to its ample lineup. This two-gallon starter jam comes with that classic plastic fermenter and spigot for maximum drinkage, yeast, sanitation powder -- not to mention your pop’' cheap beer-swigging admiration. Oh, and you also get a very straightforward, foolproof manual to help you keep the suds flowing far beyond your holiday visit home. Brooklyn Brew Shop has been peddling its beer-in-a-box kits for some time now, and with the one-gallon homebrew kits now popping up everywhere from bottle shops to Whole Foods, the husband-wife team is officially killing the game. The no-frills setup contains a curated bundle of brewing goods like whole grains, hops, and yeast, and the whole shebang is specifically designed to to fit neatly into a tiny apartment kitchen, making it the perfect gift for the hipster who loves DIY projects and is sick of tallboys. Don't let the devilish name fool you -- this kit is anything but scary. The fully outfitted "Kit Plus" comes stocked with all the regular gadgets and gizmos, but sets itself apart with a small-batch conical fermenter that transforms your standard homebrew setup into a pint-sized pro brewhouse. Caps and bottles are also included, which is a very, very nice perk -- you know, if you're planning on reaping the fruits of your labor. You know craft beer's gotten huge when a shop as mom-centric as Williams-Sonoma throws its bonnet into the ring, and the basic one-gallon kit is a solid choice for the discerning hobbyist. There are tons of flavors to choose from, including -- get this -- a 100% gluten-free option. 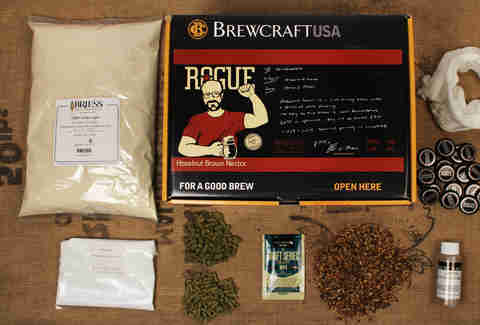 Aside from the ingredients, W-S adds all the standard brewing gear, plus a helpful instructional guide to the mix. And if the brand is any indication, it's bound to fit right in with your snazzy standup mixer and matching spiralizer. What's better than brewing beer? Brewing beer with a stiff pint of Kentucky bourbon, that's what. 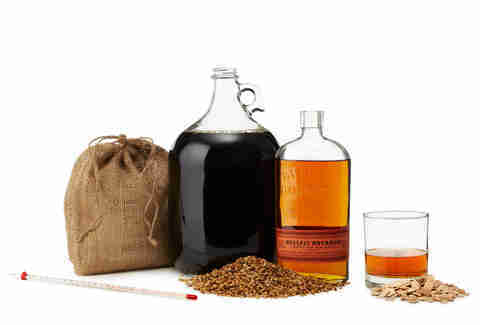 Have your booze and drink it too with this liquored-up one-gallon homebrew kit. The brew gear's all accounted for, but he coolest ingredient is a handful of medium-toasted oak chips meant to be soaked in tasty, tasty bourbon then transferred into a vat of bubbling brew for the ultimate in smoky, vanilla-tinged greatness. There's no whiskey in the box, unfortunately, so you're going to have to get some elsewhere (as if you don't already have a bottle or two laying around…). Northern Brewer is one of the homebrewing world's most trusted suppliers, and its small-batch, one-gallon intro kit is the perfect way for the brew-curious to test the waters without selling the farm. The instructions are thorough -- we're talking brew-along-DVD thorough -- and each piece of equipment and ingredient is professional brewer-approved. Northern also throws in 12 bottles with cardboard carriers, two branded pint glasses, a spill-proof Little Big Mouth Bubbler for containing feisty fermentations, and 20 caps along with a plastic capping contraption called -- wait for it! -- a capper. And since Northern specializes in all sorts of brewing gear, this kit is super-customizable and can be easily expanded while the strength of your homebrewing skills catches up to that 12% ABV barleywine you're sipping. Meredith Heil is a former staff writer for Thrillist. Looking at her watch, that brew shoulda' been home. Today she regrets the night she put that kettle on. Follow her @mereditto.